San Antonio Apartment for the best price. Best of all our services are Free. Remember the San Antonio apartment market is changing constantly. Having an apartment locator will make the process faster and easier for you. Don’t spend days online, making calls and touring apartments that may not work for you. Just call Bucks to Move and our apartment locators will work hard to help you find your next apartment Home. Our apartment locators have a state-of-the-art data base of San Antonio apartments that match your criteria. Don’t spend days online, making calls and touring apartments that may not work for you. We will review the options and discuss things like cost verses value and commute time. 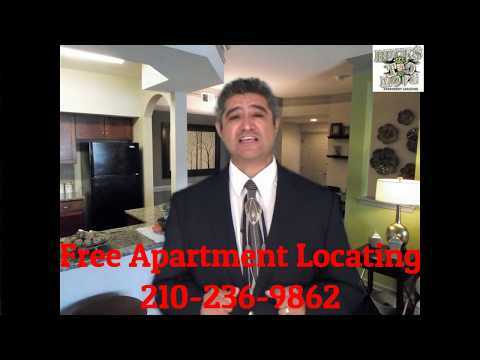 We are Real Estate agents that specialize in helping you find the best San Antonio Apartment for the best price. Our services are FREE to you and we’re available today to connect with you. As Real Estate agents that concentrate in apartment locating, we are informed about what incentives apartments are running at this time. Our knowledgeable apartment locators will make you our number one priority and match you to the property that best describes your needs. Furthermore, we are diligent about saving you time, money and stress. We call before sending you, verifying that the specials, vacancies, and prices are current. Having a San Antonio apartment locator will help you in asking the right questions and send you only to the apartment communities that will assist you in any special requirements you might have. In appreciation for using our services we will provide you with a $50 Gift Card. Choose your location below to view some of our featured apartments in San Antonio. “Oscar was very helpful and attentive during my search. I highly recommend his services. His call back times were within minutes.” Virgina S.
“Oscar was very helpful in finding my apartment. At first, he sent me available apartments and called them for me. Even when I changed my mind about Location. He was happy to update my search requirements…” April T.